As I have emphasised recently, my mother loved her dogs with a passion all through her life. And I have often been asked did she ever own a cat. The answer to that question is a definite “yes” and it was just the one cat for her lifetime but this cat was a really special cat as would befit its owner. 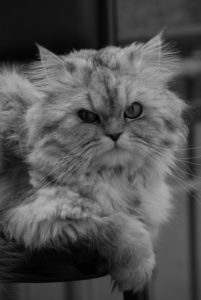 It was a blue Persian and very aristocratic, beautiful and imperious. A cloud of blue wool encased the cat in a fluffy ball and you could only just see its sparkling blue eyes. Persian cats were Imperial pets at the Courts of the Shah and his Courtiers. They were first seen in Italy in the seventeenth century and then spread all over Europe. My mother’s cat was named Flumbo. He ruled the house with a rod of iron and the dogs were terrified of him. His only challenge was when my mother bought her first Pekingese and then it was a standoff! Flumbo went everywhere with us and after a while we believed he could understand English. We went to the North of Scotland for a holiday when I was about ten and, of course, Flumbo came as well. On the way home our car broke down in Dingwall and we had to stay the night. In the evening we went to the cinema to see a bad Alan Ladd cowboy film with Flumbo too in his smart wicker box. No one had ever seen a cat taken to the cinema before! It was a sad day when Flumbo left us and my mother decided to stick to her beloved dogs. I will never forget the magnificent glorious Flumbo, he might just as well have been a dog!